Benign Paroxysmal Positional Vertigo (BPPV) is an inner ear problem that results in short lasting, but severe, room-spinning vertigo. Its name, BPPV, indicates that it is benign, or not a very serious or progressive condition; paroxysmal, meaning sudden and unpredictable in onset; positional, because it comes about with a change in head position; and vertigo, causing a sense of room-spinning or whirling, often expressed as "dizziness". Although called benign, those who suffer from this distressing and incapacitating condition do not trivialize BPPV. This condition often begins following head trauma or a severe cold. It can also arise simply as part of the aging process. It starts suddenly and is usually first noticed in bed, when waking from sleep. Any turn of the head seems to bring on violent but brief bursts of dizziness. Patients often describe the occurrence of vertigo with tilting of the head, looking up or down (so called "top-shelf vertigo"), or rolling over in bed. It is not unusual for nausea and vomiting to accompany the vertigo. Even if a spell is brief, a feeling of queasiness may last several minutes or even hours. There is no new hearing loss or severe ringing associated with these attacks, which helps to distinguish BPPV from other inner ear conditions. To understand the cause of BPPV it is helpful to understand how the inner ear works. The human ear is divided into three parts: the external, middle, and inner ear.The inner ear is a fluid-filled series of chambers. One of these chambers, the cochlea, is responsible for converting sound vibrations into nerve impulses. It is these nerve impulses that the human brain interprets as sound and what we call "hearing". 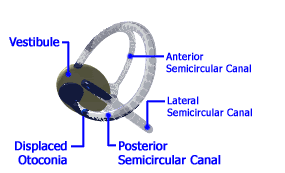 The inner ear also contains 3 semicircular canals which are responsible, in part, for sensing movement and maintaining balance. As you can see, these 3 canals (named anterior, lateral, and posterior) are oriented at roughly right angles to one another. The movement of the fluid within these canals allows the brain to sense rotation of the head through all three directions in space (e.g. left-right, forward-back, and up-down). All 3 canals are connected to a large chamber, called the vestibule. It has been discovered that the probable cause of BPPV is dislodgement of small calcium carbonate crystals that float through the inner ear fluid and strike against sensitive nerve endings (the cupula) within the balance apparatus at the end of each semicircular canal (the ampulla). (Another name for BPPV is cupulolithiasis, meaning "rocks in the cupula".) In real life, the dislodgement of calcium crystals most often occur from a fall, hitting head, car accident, or violent cough or sneezing. These crystals, known as otoconia, usually dissolve or fall back into the vestibule within several weeks, and no longer cause any symptoms. However, in some patients, these crystals become trapped in the fluid of the balance chamber and periodically cause symptoms, as gravity and head movements cause them to repeatedly strike against the cupula. In these patients, the symptoms may not subside and they become severely incapacitated. Interestingly, the loose otoconia tend to settle preferentially within the posterior semicircular canal. The most important means for diagnosing this condition is the physical examination and history of the patient. A patient with dizziness or vertigo without hearing problems suggests the diagnosis of BPPV. A normal ear exam, audiogram, and neurological exam are expected. A simple positional test, performed in the doctor's office, is usually all that is needed to confirm the diagnosis of BPPV. One such test is the Dix-Hallpike test. First, the patient is positioned on the examining table, seated upright. Then the examiner brings the patient's head down over the edge of the table and turns the head to one side. If the patient has BPPV, the examiner will witness a characteristic movement of the eyes, call nystagmus, that begins after a few seconds. If the nystagmus is seen and the patient becomes dizzy, then the ear which is pointing toward the floor is the one with the loose otoconia. If no nystagmus is seen the examiner will repeat the test, this time turning the head to the opposite side, thus testing the other ear. Recently, researchers have found that a simple and well-tolerated physical therapy technique performed in the office can relieve the vertigo in a high percentage of patients. The Otolith Repositioning Procedure of Semont and Epley has become well accepted and is based on using gravity to move the crystals away from the nerve endings into an area of the inner ear that won’t cause any problems. As the patient is moved into the various positions of the maneuver, the posterior semicircular canal is rotated in such a way as to deposit the displaced otoconia back into the vestibule where they can do no further harm. In our experience, approximately 85% of patients are cured with one maneuver. This percentage increases with repeated treatments. Following the maneuver, patients must not lie flat for 48 hours, meaning they should sleep in a recliner or propped up on pillows. Even tying shoes or bending over should be avoided during this 48 hour periord. These instructions help prevent the crystals from falling back into the balance chamber. Rarely, when time and the otolith repositioning techniques have failed, severe cases may eventually require surgical intervention. The following are of several procedures which may be considered.